Wasn't planning on getting a new car until I seen the one I just had to have. Thanks to Tony Kay and Kevin Feldkamp for making it happen. Tony Kay was my salesman. He was very knowledgeable about all the vehicles, very friendly, always smiling, good looking ( ladies go in and car shop with Tony. HE IS SINGLE), one of the best car salesman I've ever met. As for Kevin Feldkamp, he is the man!!! Thanks to Kevin, he is the one who made it final for me. He got me a great deal. He made sure I was driving out of there with the new car I wanted so badly. 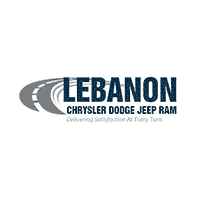 If you want a great deal and want to be treated with respect, go to Lebanon Chrysler Jeep Dodge & Ram. You wont regret it as long as you ask for Tony Kay. Chris and Gordon were wonderful. They made me feel at ease and the process was great. I walked in not knowing what may happen but they made it well worth going to them. Chris, my salesperson went above and beyond to take care of me. And Gordon has always done the same. They met my needs and got me back to work on time. When I came back for the paperwork, it was already in process. Very easy. Have purchased several cars and trucks here. They are good to their word. Good deals, good vehicles. Great service department. Love the truck I just bought.